If you ever decide to read only one Erin Watt book, One Small Thing should be this book. Beth Jones is a senior at highschool and her life isn´t a easy one. Her parents shelter her and suffocate her at the same time. Their restrictions and mistrust hurts Beth deeply. And then there´s Chase Donelly, the new boy at school, the bad boy she should stay far away from. But they´re like magnets and she can´t stay away from him. Chase made mistakes in the past, mistakes that changed his and others lives for forever, and Beth is one of them. There are only a couple of authors I can rely on to write stories that speak to me every single time. Erin Watt is one of them. I still remember reading The Royals Series and how I was blown away. I was sucked in and instantly a fan of the author’s writing. That was the beginning, I haven’t regretted it once. I love every single story of Erin Watt and they´re one of my few one click authors. Their characters "speak " to me and I can live with them in their world. 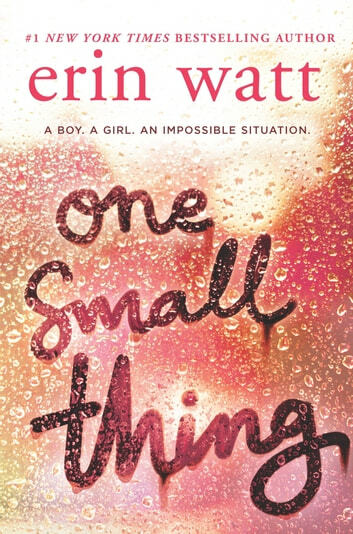 One Small Thing is a heart wrenching, tear jerking, page turning story that gutted me and left me in a major book hangover. I highly recommend One Small Thing and wish I could give more than 5 stars. 4.5 Stars Review by Amy Late Night Reviewer Up All Night w/ Books Blog One Small Thing was such a touching standalone story that filled me with a gamut of emotions and left me with a smile on my face. Erin Watt did such a stellar job of building an amazing connection with the characters that I didn’t want it to end. This was my first book by Watt and I look forward to reading more. Beth’s life has never been the same since her sister was killed in an accident three years earlier. Intent on finding a little fun before she starts her senior year, she sneaks out to a party and finds herself smitten with Chase, a quiet guy she finds floating in and out of the party like a ghost. After spending a memorable evening together, they go their separate ways. Beth shows up the first day of her senior year and finds Chase attending the same school, but she soon finds out he is not who she thought he was. The connection they had still plays in her mind though, and she struggles to decide if she can forgive his sordid past and start a relationship with him. It doesn’t take Beth long to realize her decision affects so many more people than just her and Chase, and the pain and emotion that she struggles with while she balances her family, her thoughts, and her heart becomes too much. What choice with Beth make? Will she follow her heart or sacrifice her happiness to keep the peace? These teens found themselves in such a difficult situation and they had to make some very adult decisions. Meanwhile the adults around them were making juvenile and shallow judgments. It was such an interesting concept and I am so glad I had a chance to read this. The pacing was perfect, the characters were entertaining and the emotions were raw. There is nothing like a great love story that overcomes all odds to be together. I really loved this one!